India is a country in South Asia. It is the seventh-largest country by area, the second-most populous country with over 1.2 billion people, and the most populous democracy in the world. Bounded by the Indian Ocean on the south, the Arabian Sea on the south-west, and the Bay of Bengal on the south-east, it shares land borders with Pakistan to the west China, Nepal, and Bhutan to the north-east; and Burma and Bangladesh to the east. In the Indian Ocean, India is in the vicinity of Sri Lanka and the Maldives; in addition, India's Andaman and Nicobar Islands share a maritime border with Thailand and Indonesia. India is the seventh largest country in the world. 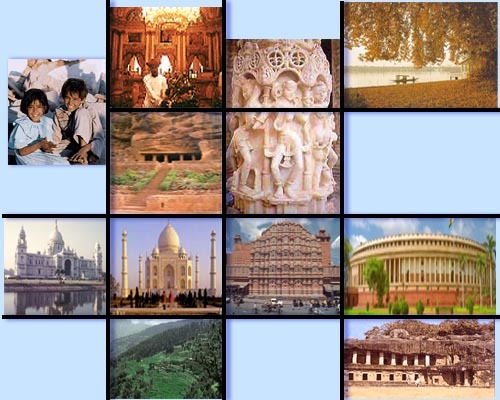 Few countries in the world have such an ancient and diverse culture as India's. Variety in religion, racial and languages are a special hallmark.India a land of cultural and social diversity is all-pervading and yet a harmonious balance permeates throughout the social fabric.It stretches from the frozen Himalayas in the north to the tropical Indian Ocean in the south, with the sacred Ganges River flowing from west to east. During the period 230 BCE to 220 CE, Satavahana empire covered much of India. The Satavahanas are credited for establishing peace in the country, resisting the onslaught of foreigners after the decline of Mauryan Empire. Satavahanas are also credited with furthering Budhism in India including Ajanta caves. According to the World Bank, as of 2011, the Indian economy is nominally worth US$1.848 trillion; it is the tenth-largest economy by market exchange rates, and is, at US$4.457 trillion, the third-largest by purchasing power parity, or PPP. With its average annual GDP growth rate of 5.8% over the past two decades, and reaching 6.1% during 2011–12, India is one of the world's fastest-growing economies. However, the country ranks 140th in the world in nominal GDP per capita and 129th in GDP per capita at PPP. Field hockey is considered the national sport in India, and the country has won eight Olympic gold medals in field hockey, though cricket is the most popular sport. Recent RTI revealed that India has no National game though people used to say it was hockey. After the 1982 Asian Games hosted in New Delhi, the capital city (New Delhi) now has modern sports facilities, and similar facilities are also being developed in other parts of the country. India has hosted and co-hosted several international sporting events. Such events include the 1951 and 1982 Asian Games, the 1987, 1996 and 2011 Cricket World Cup, the 2003 Afro-Asian Games, the 2010 Hockey World Cup and the 2010 Commonwealth Games. Major international sporting events annually held in India include the Chennai Open, Mumbai Marathon, Delhi Half Marathon, and the Indian Masters. In 2011 India also hosted its first Indian Grand Prix at the Buddh International Circuit, an Indian motor racing circuit in Greater Noida, Uttar Pradesh, India.